Alrighty folks, I've got something for the wellness crowd today. That's not something I usually say, but it's a pretty important disclaimer on a review like this. I am Dubba and I love old fashion ice cream, I rarely dabble in Arctic Zero, Halo Top, or anything like that. However, Brio is a young company that has recently reformulated their product and they asked if I would be interested in trying some free samples. These samples will showcase a switch to organic milk, the addition of probiotics, and a new vanilla flavor in the lineup. 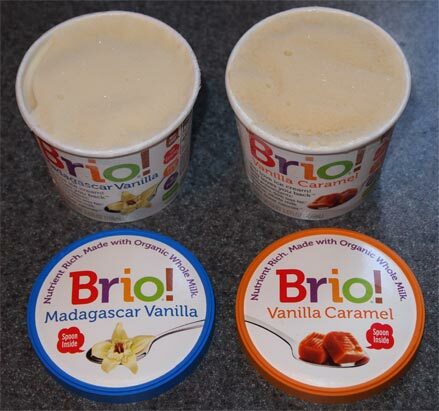 That said, Brio still features a bunch of vitamins and protein in a product that is lower in fat and calories than your average ice cream. Vanilla Caramel Brio: I see why they call it vanilla caramel. It's reminiscent of the vanilla but has a mild caramel flavor as well (as we would all expect). Again there is a certain... something to it. 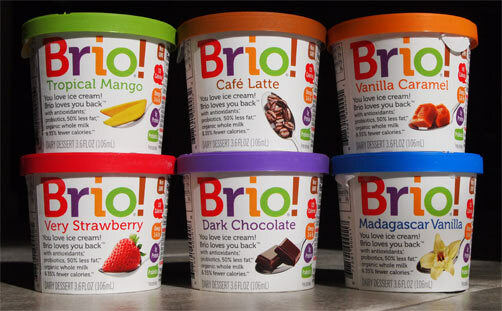 It's not like halo top or arctic zero in terms of texture, Brio seems better than that, but as someone who is texture sensitive, I will definitely need a bit of adjustment time to get in to a product like this. If anything, the vanilla caramel kind of reminds me of the old Healthy Choice ice cream. I stir up the last little bit and it's not bad. At least I got some vitamins right? I go back to finish the vanilla but the vanilla caramel has apparently thrown my tastebuds off. I try a handful of salty chips but it's too late to go back. I finish it but I don't really enjoy it. Dark Chocolate Brio: It makes sense that they would go with dark chocolate here (instead of milk chocolate) and it is reminiscent of other dark chocolate flavors you've had. I am enjoying this more than the vanilla, but you can still tell that there are unfamiliar ingredients in the mix. I don't know if it necessarily feels like a "diet" food, but it has that air of like 12 grain bread or popcorn chips or some other high fiber treat you might dig in to when you attempt to eat healthier. In other words, if you are in their targeted demographic, I can see you going "oh boy, chocolate time!". The dark chocolate flavor is fine at first, it's just everything else that comes after it is what is going to take time to get use to. Cafe Latte Brio: I'm still hungry so let's just take a quick look at this and realize that one bite is plenty. You all know that I don't enjoy coffee ice cream and this serving is no exception. It's quite bitter to someone like me and I'm good with trying one bite. I will say that there is a good chance that the coffee has overridden most of the oddness I noticed in the other flavors, but I'm not pressing on to verify this fact. I want to give an apology because it's been a month since I first started trying these Brio cups. The company was nice enough to send these over and I let myself get behind. Well, no more! Strawberry Brio: Soft, creamy, and a little bit of that whatever I noticed before. There is a fair amount of strawberry flavor though it would be nice to see some little strawberry bits to get a true strawberry bite here. This doesn't have the clarity of some sorbet or fruit pop, this is definitely a dairy dessert. Tropical Mango Brio: Now unlike the strawberry, the mango is quite potent. If you are a regular reader of this blog, you probably know that I don't really like mango. This one is very strong and I am not designed to review something with that much citrus bite, so back to the strawberry. This reminds me of something but I'm not sure what, maybe a strawberry froyo I had along the way? I wonder if black raspberry would work as a Brio flavor. The cup is finished and I'm left debating if strawberry is my most favorite of the bunch (followed by the dark chocolate). Well, that's it. Six flavors in all, four of them I finished. You are probably expecting me to go "I really didnt like these" but that wouldn't be fair. You can't compare a product like this to Ben & Jerry's. It's like comparing apples to pretzel. Yes, you eat both of them but that's about where the similarities end. Look, like I said at the beginning, this is meant for the wellness crowd. We all have our particular food regimen and for those who no longer indulge in the high octane stuff, I think you might like this. If whey powder and protein shakes and what not are in your regular rotation, you're less likely to notice their impact here. 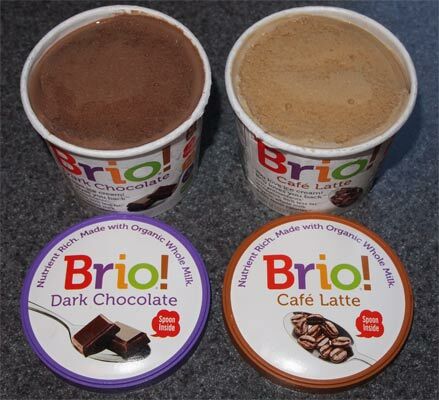 Brio is soft, creamy, cold, and healthy enough. At least it still feels like ice cream, and it's cold like ice cream, and it serves its purpose. No I wasn't in love at first scoop but that's just because it's different and different isn't necessarily bad. It has a goal in mind and it went for it. Would I tweak these? Of course. Take the potency of the coffee and mango flavors down several notches, add in a black raspberry flavor, and then maybe do something like a pumpkin flavor (HA! I kid, I kid!). So, I wish Brio the best and thank them for the samples. I hope they continue to listen to their fan base and tweak as necessary as they go. My gut says there is potential here because of the texture and I'll leave it at that. Yeah, that's a fair point to make, though I'm still pretty sure they are aiming for the same target market, especially when they start using the term "meal replacement". I don't see how the probiotics can survive being frozen.